A modified laccase (D439A/M510L CueO) with N-His6 tag attached to it via a linker sequence and an export tag (HlyA, BBa_K554002) attached to its C-terminus. Figure 1. The degradation of ABTS by the lysate of ModLac whitout export tag and the lysate of CueO over time. Note: The Characterizing was made of the same modified laccase but with the exeption that the export tag was removed (See figure 1). The enzymatic activities of the laccases was measured using ABTS. 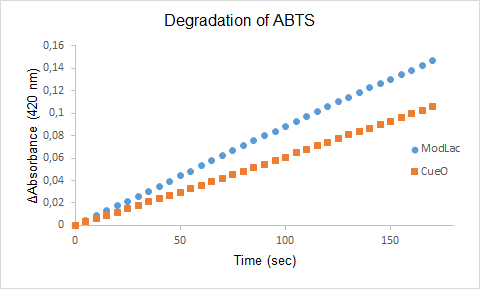 ABTS is a commonly used substrate when evaluating reaction kinetics of specific enzymes. Due to its reduction potential, it acts as an effective electron donor. Since we are working with laccases, that have the capability to oxidize ring structure, ABTS is a suitable substrate. ABTS will donate an electron to reduce molecular oxygen. The oxidized ABTS has a different absorption spectrum and the reaction can thus be observed in a spectrophotometer. The enzyme assays of the lysates with ABTS showed a significant difference in enzyme activity between CueO and the mutant CueO, also known as ModLac. The modifications of the laccase that was made increased the enzymatic degradation of ABTS. This is confirmed by our results (See Figure 1).